CARBONDALE, Ill. — Suicide is the second leading cause of death among people ages 15-24 and 10th overall, but Southern Illinois University Carbondale is taking action to address this devastating problem. Also at that time, people are invited to visit the “remembrance tree” where they can take a packet of flower seeds, including such poignant plants as forget-me-nots, and in its place, hang on the tree a leaf bearing someone’s name. The American Foundation for Suicide Prevention (AFSP) will have assorted T-shirts, bandanas, wristbands and other items for sale. Winston’s Bagels by B-Rad will also be on hand and there will be honor beads for participants, with various colors symbolizing the relationships involved with survivors, suicide victims and those struggling with mental illness. Increasing awareness of the terrible impact of suicide. Supporting people who have suffered loss due to suicide. A raffle is being held in conjunction with the walk as well. Numerous great prizes, including a wide variety of gift cards, services and products, are up for grabs. Sponsors for the 2019 walk include: Southern Illinois Healthcare, Bomber Crew Tattoo, Dunkin’ Donuts, Centerstone, SIU Credit Union, E. Claire Salon and Spa, BPL Plasma, Rainbow Café, uBreakiFix, SIU Student Health Services, SIU Salukis on Your Side and The Varsity Center. 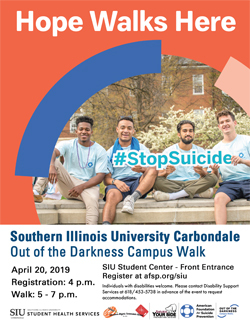 For more information about SIU’s Out of the Darkness Campus Walk 2019 online or contact Angela Peterman at 618/536-4441 or angela.peterman@siu.edu or Beth Morrison at beth.morrison@siu.edu.